Posted: Thursday, June 25, 2015. 3:31 pm CST. Thursday, June 25, 2015. BMG: The power players in cruise tourism were back in the Supreme Court on Wednesday resuming arguments over – fundamentally – who will control the future of cruise tourism in Belize: will it be the Fort Street Tourism Village, or will it be The Feinstein Group and their Stake Bank Project? Feinstein can’t start his Stake Bank project because of legal hurdles put in his way by previous arrangements signed by the Musa administration. That gives the FSTV owners some level of domain over his project. And so now, as means of counter-attack, he’s going for their money maker: the head tax, arguing that only government – through parliament – can levy taxes. The FSTV and the Belize Tourism Board don’t have that authority – so he argues that the head tax is illegal. Now, that represents millions of dollars in earnings annually for the Fort Street Tourism Village – so they are prepared to fight it tooth and nail. Caught in the middle is the Government of Belize. The case continued with arguments from Deputy Solicitor General Nigel Hawke. Hawke argued to the court that the Government does not directly control the collection and distribution of the head tax, and if it is found to be a tax and fee, then it is within its power to allow for the status quo to continue while Government prepares and passes appropriate legislation, perhaps as early as this Friday’s house meeting in Belmopan. But Feinstein and his attorney Andrew Marshalleck disagree, saying that the provisions on the head tax in the agreement between FSTV and the Government and Tourism Board are not enforceable and invalid because they are illegal. 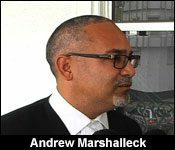 According to Marshalleck, Government is concerned with breaching the provisions of the agreement; a ruling in Feinstein’s favour would remove some of the concerns although there are others. Arguments continued Wednesday afternoon and Rodwell Williams will be the last to respond on behalf of the Fort Street Tourism village when the case wraps up later this week. Photo courtesy of Channel 7.